Summer is one of the most exciting times of the year for us at Tyndale House. This year’s busy season began in May with the arrival of scientists and academics from around the world who are part of a project to study a fascinating Bible manuscript called Codex Climaci Rescriptus (CCR). It is highly unusual for such a large team to assemble in order to push forward the boundaries of our manuscript knowledge together, and so “CCR week” was an important time not just for Tyndale House but for scholarship in general. On June 25, Tyndale House again welcomed guests from across the globe to our annual Tyndale Fellowship Conference, which has been a fixture in the Bible scholarship calendar since the 1940s. The conference is one of the key ways that Tyndale House works to unite Christian Bible scholars in this vital academic discipline. These activities, and others like them, are only possible because of the generous donations of our supporters, who recognize that equipping Christians to be at the forefront of positive Bible research is vital for the Church. Thank you for your partnership in this work. With the help of a team of world-class imaging scientists, Tyndale House research associate Dr. Kim Phillips has identified eight words in Ancient Aramaic that were previously unknown to modern scholars. The breakthrough came during the week-long CCR project, which gathered a team of 14 international experts in Cambridge from institutions as diverse as the Early Manuscripts Electronic Library, the Lazarus Project at the University of Rochester (in New York), and the Museum of the Bible Scholars Initiative. Codex Climaci Rescriptus is a 292-page manuscript, three of whose physical leaves (folios) have been carbon dated to the fifth or sixth centuries. Owned by Museum of the Bible in Washington DC, the codex contains a Syriac translation of writings by John Climacus, head of St Catherine’s Monastery of the Sinai in the seventh century. However, this upper text was written on the recycled pages of a number of older codices, whose original (lower) text was erased to create a blank canvas for the new writing. Using multispectral imaging, scientists can now scan the pages to reveal the erased text, allowing many of the more difficult parts to be read for the very first time by modern scholars. Are you a Bible scholar looking for your next challenge? Tyndale House is currently recruiting a Research Associate in Old Testament and Ancient Near East to work with us at the institute in Cambridge, UK. This opening offers a rare opportunity to join our innovative team, which is passionate about serving the global Church with biblical studies at the highest level. To find out more, visit www.tyndale.cam.ac.uk/vacancies. Customers of Amazon.co.uk online shopping can now raise money for Tyndale House just by making a purchase. The company’s SMILE programme, which gives a donation to charity for each Amazon sale made, is now available in the UK, and Tyndale House is signed up as a beneficiary. To earn money for Tyndale House, UK shoppers need to visit smile.amazon.co.uk and select us as their chosen charity (by clicking on the orange “Supporting” tab on the website’s toolbar). After that, every time you want to make a purchase from Amazon, simply access the website through smile.amazon.co.uk instead of the usual Amazon address, and 0.5% of the price of your item will be automatically donated to Tyndale House. One of our delegates had been the victim of abuse long ago, something she had struggled with for many years. Your preaching on the last day of your visit allowed her to face that struggle head-on with the power of Christ. That day has changed her life and Lord willing, the many she serves will also be touched with that same power and joy. 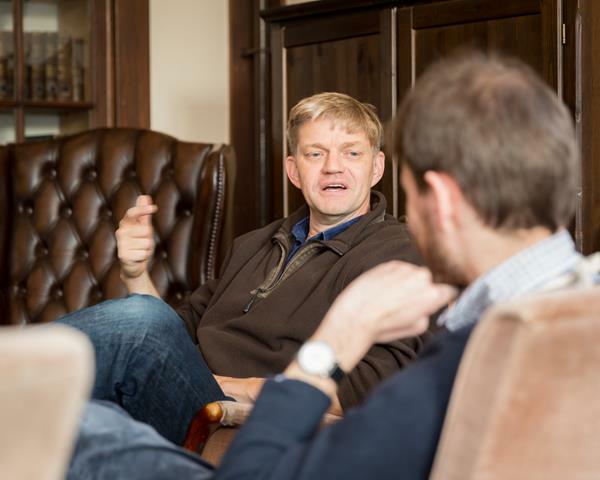 The research of Tyndale House is never merely for the sake of more head knowledge — in all our work we seek to equip Christians and their preachers to have a greater faithfulness to Scripture and a deeper understanding of the Word of God. Tyndale House is almost entirely funded by donation, and our work is only possible because of the generosity of our supporters. Will you consider giving to the work of Tyndale House?